Lots of good stuff coming up; stay tuned! You had me at “together we are all one”. I believe in a collective spirit, a small part of which each of us is graced with to gently guide us. My inner spirit lifts when I am able to breakdown the illusion of separation. I am a sinner and a saint. We are all one. I saw you have the outstandingly wonderful “pebbles for your pocket Meditation” in your favourites. This is a beautiful Video. Thanks for sharing your YouTube link. And this is of the horses and mules in the grand canyon. They were carrying the mail and other stuff out. Unfortunately the movie page is missing (404 error). Can you post it on YouTube? Thanks for your kind words dear brother. My practice is to share the dharma the simple way I live it. I just checked and the youtube link worked for me. Mysterious things happen on the web I can’t explain. http://www.youtube.com/user/rezdoglatte/videos . Perhaps sometime you might view the Bhikku Bodhi, Ven Pannavati and Joanna Macy clip. May you be well, david. Your photos are stunning! Thank you so much for sharing them! Thanks so much for visiting my blog today. I’m smiling perusing your blog! Cool. Thanks for the link to the videos. Bookmarked it. I like them a lot. 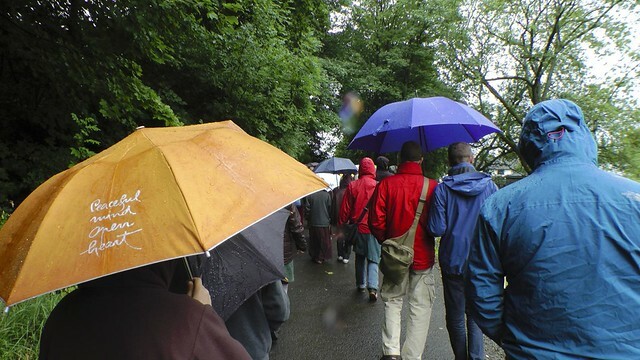 In fact, I started thinking that I would like to go to the centre and see Thich Nhat Hanh, and be around the mediators. It’s so inspiring hearing him speak. When I went to the website [of the centre] I couldn’t figure out how to go there, prices and such. Can you fill me in? Thich Nhat Hanh is one of my favorites too and inspires much of my yoga and my writing, although I have not been fortunate enough to meet him in person. Thanks for sharing his wisdom and teachings through this lovely site. Thanks for liking my new blog! I like your focus on practical application of the Buddha’s teaching. Smilecalm! a pleasure to meet you online. I’ve enjoyed your Pebble Meditation video since Gary recommended the meditation itself and I found your wonderful resource. Thanks for taking the time to visit my blog and for sharing your art and experience. Thank you for the meditation resources and sharing your gift. Thank you so much for the visit and like on ‘Nimbus 9 at Deep Pit Manor.” I visit your site and always learn something new. Thank You! thank you, JC for your kind words!